Last July I had the privilege of accompanying 29 NZ Defence Force veterans, care givers, medics, facilitators and officials on a trip to South Korea to attend ceremonies commemorating the 60th anniversary of the Korean War armistice. The commission required me to observe, document and chat to all and sundry in order to synthesize my experience of the event into a work of art - No pressure! Setting off from Auckland, my fears of stiff collared military types with epaulettes and shiny bits were quickly dispelled and I relaxed with the knowledge that everything was handled with 'military precision' yet friendly atmosphere. The veterans, as you would expect, were a wide and varied bunch, enlivened by the opportunity to share the times with comrades in arms. An active schedule had us up and down the peninsula to attend ceremonies and events honouring our veterans. The gratitude toward these men from the South Korean people to was clearly evident and touching to witness. I could go on of all the special things I experienced on this tour but the gold I'll carry with me were the conversations, anecdotes and insights I garnered from those gentlemen veterans who were fortunate enough to make that trip. Although I heard but a few, all had stories of their tour of duty and carried with them photos, poems and writings they had made and shared them freely with those who cared to enquire. They spoke with nostalgia of the reasons why they volunteered at a time when many were barely out of short pants. These connections were the reason I was there and for that I am ever grateful. For the veterans, beyond the fanfare of diplomats and media, they had a rare opportunity to pay possibly, their last respects to those who made the ultimate sacrifice. When thinking about how I wanted to approach a painting to commemorate NZ&rsquo;s involvement in the Korean War, images of uniforms, good keen blokes and the battle weary initially sprung to mind, but further investigation led me toward the commemorative event itself and the veterans of today; the ones who still laid their lives on the line in doing their &lsquo;duty&rsquo; but also, who survived to carry the memories 60 years on to this current day. I listened to the anecdotes, viewed photos and observed, endeavouring in some way to empathise with the emotion involved in returning to the Korean Peninsula where events experienced there by those then, young men would have undoubtedly shaped that individuals life henceforth. I consider this painting a 'veterans' painting, a reflective work which marks the solemnity, respect and importance toward the observance of that &lsquo;two minutes of silence&rsquo; tradition. Whilst the painting outwardly is a portrait, it also references characteristics specific to the commemorative trip itself. I wanted my model to be a regular soldier and I chose an image I photographed of George (Tim) Flintoft who was a driver during the war, he also happened to be the first veteran I met on arrival in Auckland prior to our departure and seemed to me very much a man not only of stature but also of great sensitivity toward the occasion. Mr. Flintoft stands in formal attire with cane in hand and presents his military medals over his heart. South Korea&rsquo;s national flower &lsquo;The Rose of Sharon&rsquo; (Hibiscus Syriacus) is pinned to his right lapel and places him geographically, as does the koru motif which references a portion of the granite NZ memorial at the United Nations Memorial Cemetery in Busan. 34 of the 45 who died are layed to rest here and observing the veterans connect with familiar names embossed to bronze plaques among the aisles of roses was a very moving experience indeed. Poppies float around Mr. Flintoft as a symbol of the fallen and remind us that whilst soldiers, these men were also dads, brothers, sons and friends, lest we forget. 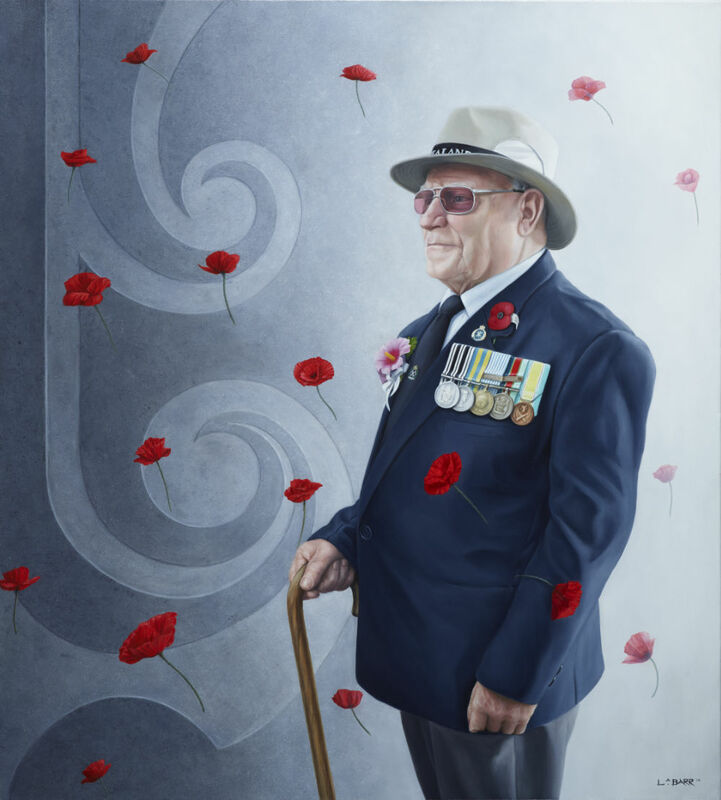 I feel honoured, humbled and privileged to have had this experience and therefore take pride in presenting this painting into the New Zealand Defence Force art collection. Commissioned work for the NZDF Collection.